The Cartoon below is the Cover for the latest Tamil Monthly Thuglak run by Mr.Cho. Ramaswamy... A Man know for his Satires. MMS: Thanks. Thank you for saying that I would be the PM of INDIA, if we are elected again. SG: Well, the doctors have advised complete rest for you after the Surgery and you cannot & should not do any work. That's why. 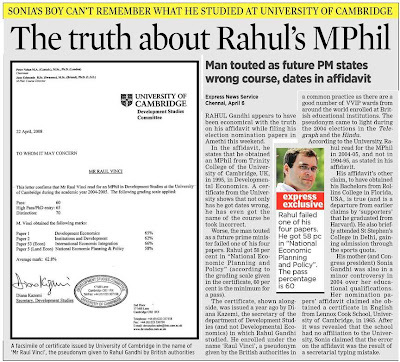 What Politics can do to Rahul Gandhi touted to be the Future Leader ....errrr.... PM of INDIA !!!! With her kidneys not supporting totally, even when she was in great pain, she would happily sit for him, before him for hours together... for she knew her man would suffer more if she complains of a little head ache..
Am asking those who spoke in length and breadth, who wrote long posts about the stupid men who over powered women and nun in Orissa!!! Who spoke in volumes about the sanctity. Let you not be mis quoted that am against religion or any beliefs. I don't speak secularism. I am not secular. At the same time am not prejudiced. If something is wrong then its wrong. His/Her belief doesn't bother me. I say this, because for I know all those who speak so much about equality and secularism are only but pseudo secularists. If all I have learnt and understood is true and correct, then I known only One Secularist and he is E.V.R. Why am I looking for the Evangelists, the catholics, the baptists now? For am seeking a honest answer from them for this Former Sister Jesmi. What was the one mistake she did? She joined the congregation. Was it a heinous decision that she took? Does wanting to serve the God means adjusting the Church Heads? "இசை என்றாலே தமிழில் புகழ் என்றுதான் பொருள். அந்தப் பொருளுக்கு ஏற்ப பூத்து, மலர்ந்து, புகழ் பெருக்கி இன்று சிகரத்துக்கே சென்று, சிரித்த முகத்தோடு நம்முடைய வாழ்த்தக்களைப் பெறுகிற, சென்னையில் பிறந்த செல்வன் ஏ.ஆர்.ரகுமான். இவருக்குக் கிடைத்துள்ள ஆஸ்கார் விருதுகள் கண்டு முத்தமிழே முறுவலிக்கிறது. "சிறுபான்மை சமுதயாத்தைச் சேர்ந்த இந்தச் செல்வம் இன்று ஆஸ்கர் விருதுகளைப் பெற்றதன் மூலம் தரணி வாழ் கலைஞர்கள் உள்ளத்தில் எல்லாம் இடம் பெற்றுவிட்டார்."" The highlighted wish translates as " Though being a minority, you AR Rahman the wealth of TN by winning the Oscar, you have taken a special place in everyone's heart across the Globe"
A question to the CM: Why should you wish him like this? You could have better taken rest in your hospital bed than saying this. I know Indians.. esp the South Indians go frenzy about their Matinee Idol.. but this one was byfar too much to digest... Last Week I had been to Chennai and this is what I saw in the Alwarpet Signal.
" Shri. Shri. Shri. M.Karunanidhi eldest son M.K. Muthu and his loving son and the grand son of shri. 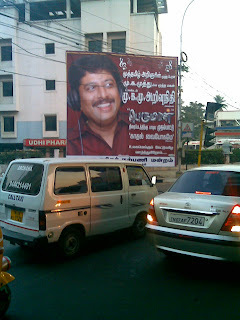 M.Karunanidhi, Mr. M.K.M Arivunidhi has sung his first song Kaadhal Vaibogame ( remix) in the Movie "Perumal". We the ardent fans of him wish the Song a great success. Your Truly: Arivunidhi's world wide fan and welfare association. Now tell me what do I have to say for this? The man who knows so much about culture, is now getting your recognition by sending these many. They were names whom we should have erased and who are not worth any recognition, in any form, now he is getting a free publicity. Thank to all those "Consortium of Pub going, Loose and Forward Women"
There have been more atrocities against women than these. May I please know, where have you girls been when there were more prominent and disgusting human rights violations happened? Why have you not sent frogs or something to that effect to parents and to the villagers here. Do you know that for every 1 minute more than a 1000 women get abused - physically & mentally either by their own people or from some unknown stupid idiot in some form? Where were you when 2 girls where molested in a road on New Year's eve? What kind of protest did you all lead when the molesters where arrested and when a few where let free? May I take that you have started this campaign because PUB is a place where you visit and just because you feel insecured, you have started this andolan? Why should I not say this? Am extremely sorry if your Standing up for Woman is questioned by someone who is as insipid as me. Maybe, am not as Feministic as you are. To be honest with you, am more angry than what you girls are. Please tell me what have you achieved by sending Chaddis to them? Why have you not thought about coming to streets, organising protest across India on the same time, same day? There's no wrong in showing or registering your anger. But how you show it is more important. We need to learn from Gandhi - his Satyagraha. Why not all of you plan to meet or organise your protest against those goons opposit their office. Why not a silent march from the Pub where it all started, to the Collectors office or to the District Head's office? I was more worried when our honourable Minister for Women welfare says "Pub Bharo". Does asking Women to goto a Pub and raise a toast to all the Women beaten black and blue solve their pains? When a Minister says this, its really worrying. What happened to our honourable Health Minister? What is his stand on "Pub Bharo"? Sir, being a women I totally understand your worry about the Indian Culutre getting diluted. You worry about the girls taking to alcohol. 1. Please show me where it has been mentioned that it is righteous for men to drink and women to be a victim of abuse hurled to them by drunkards? 2. If you are so angry at girls taking to drinks, has it ever been atleast slightly suggested that men drinking liquor is part of our Culture? Why should the men not be beaten up sir? 3. Also, Why have you not chosen to raid the manufaturers of liquor? Why not the liquor barins sir? If you are getting your donations from any of te barons, am sorry sir. In that case, liquor manufacturing is a part and parcel of our culture sir. 4. Or, are you afraid to raid them Sir? IF you are not, then please give a nation wide call, then all those innocent hapless victims of drunkard husbands would help you in the protest. 5. Sir, I completely agree that girls have to wear saree, as that is our culture. Isn't dhotis and kurtas dress code culture for men? That is what I read sir. Correct me if am wrong. 6. Sir, also after when your goons gave us a teaching in the Mangalore, I tried to recollect where in our culture it has been mentioned that the most sensible thing is to beat girls? 7. Don't you atleast now feel a little embarassed after having recieve so many chaddis from women from a select group of women sire? I know you would not. For it has been bestowed upon you by God to protect the Cultural values of India , in India.